I may be a few weeks late on posting this, but that seems to be a trend for me lately. Anyway, last month, I participated in my first group break in quite a long time, when Colbey at Cardboard Collections hosted one of his famous Affordable Group Breaks. Now, with most of these that he does, you can expect a lot of base and inserts, with a few hits, as that is the only way to really keep the cost down. This one would prove to be an exception, as he was able to find a hit-only product as one of the boxes. 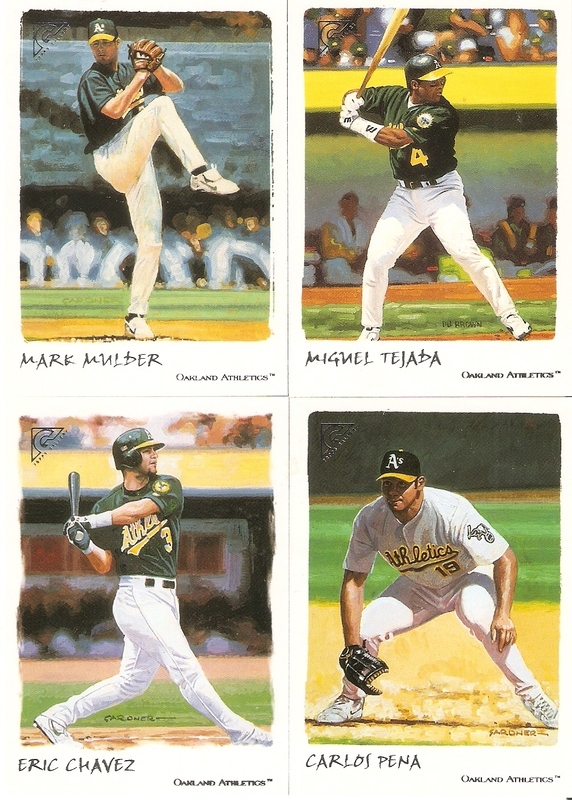 2004 Topps Clubhouse Collection was a 10-pack-per-box product, where each pack contained two cards that were either an autograph or memorabilia card, which by itself would provide 20 hits! 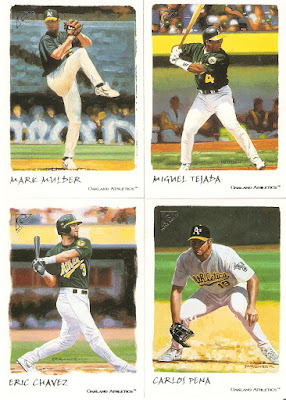 Alongside that was 2002 Topps Gallery. Of course, Gallery wouldn't give us the hit count, but it is advertised as an "All-Painted" set, and the cards look amazing, so I was in. I got in early, so I was able to claim the Chicago Cubs. We were also given a random team, which for me, was the Oakland Athletics. I wasn't really interested in the A's and tried to shop them around. 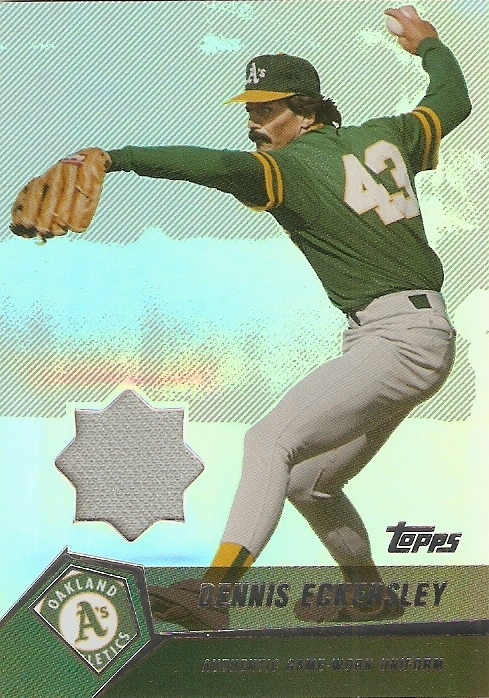 I ended up holding on to them, and it's a good thing, two, as the A's had THREE memorabilia cards pulled from Clubhouse Collection, including two Hall-of-Famers. Dennis Eckersley and Rickey Henderson were the big two, as both have been enshrined in Cooperstown, and Tim Hudson was a pretty good pull as well. While I wasn't too excited about the A's initially, they ended up being a great team to have, as the Cubs had a big goose egg in the hit department for this break. The Cubs did, however, come through big with the base cards in the Gallery box. 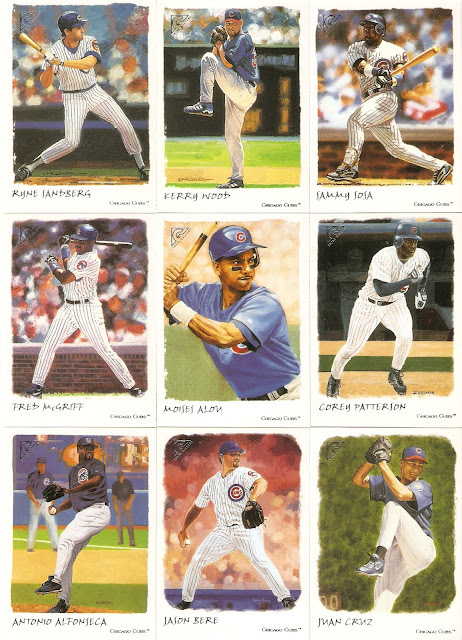 I got nine of them, including some of my all-time favorites, like Ryne Sandberg and Kerry Wood. 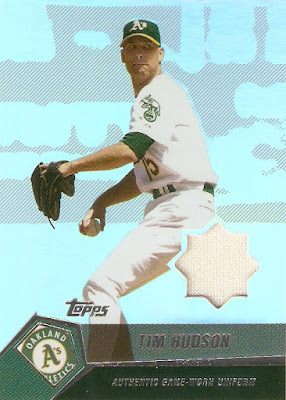 The A's didn't give me anything too special here, other than another Tim Hudson card, so I suppose there was some level of balance between the two products. The big hit of the break ended up being a Lou Gehrig bat card from Clubhouse Collection. I may have missed out on that one, but any time you can come away from a break at this price point with three hits, you know you've had a good one. Congratulations on landing the A's. 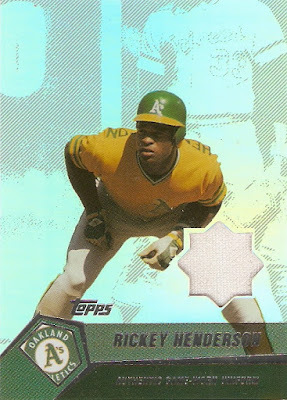 I actually went out and grabbed the Rickey off of eBay when I saw it pulled. Great looking card. If you ever want to trade that Hudson relic, my PC of his could still use it!